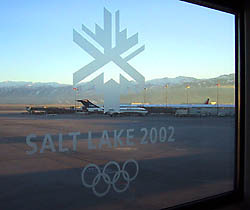 Salt Lake City was my third Olympics; I was also on the TV crew at Seoul in 1988 and at Atlanta in 1996. But I learned some new terms this year. For example, Oly is headlinespeak for Olympics. Mag and bag is a procedure that we television technicians went through every day. We had to walk through a metal detector (magnetometer) while our bags were X-rayed and searched. This was a nuisance, but not a major one. In the beginning, any metal would set off the magnetometer; I had to remove my watch and glasses, rendering me temporarily timeless and sightless. After a couple of days, however, they backed off the detectors' sensitivity and the procedure became a fairly easy routine, no worse than having to scrape the frost off your car's windshield every morning. The group that sang the National Anthem at the Opening Ceremony was known as the MoTabs inside our production truck. To the general public, they were perhaps better known as the Mormon Tabernacle Choir. And Utahn is what a Utah resident calls himself. The national media seem to think it should be "Utahan," but local newspapers omit the second a.
I always thought that there was a general rule for forming such words. If the state already ends in a, you should simply add n (Alaskan, Californian). But if it doesn't, you should supply it by adding both a and n (Mississippian, Ohioan). However, like a demanding professor, these Utahns are reluctant to hand out a's for no good reason. To a Pennsylvanian, "Utahn" looks uncomfortably close to the stereotype of the Pittsburgh accent, as in "Are yunz goin dahntahn?" And the missing a might set a bad precedent for a citizen of another state, like the Coloradon or the Missourin or the Tennesseen. 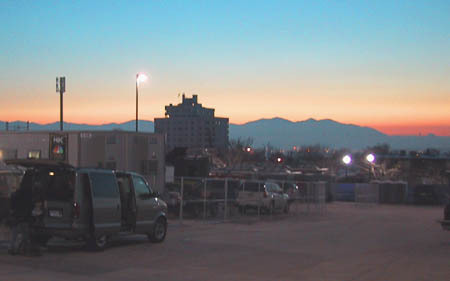 Here's a sunset over the mountains that surround Salt Lake City, as seen from our TV compound outside the Ceremonies. One day our van driver was from Dallas. She doesn't like Salt Lake, she told us, because the mountains make her feel claustrophobic. She prefers to be able to watch the sunset all the way down to the horizon. Local media often assign their own special labels to their markets. To the Los Angeles Times, southern California is "the Southland." Arizona Republic writers refer to the Phoenix area as "the Valley of the Sun." In my own part of Pennsylvania northeast of Pittsburgh, the local newspaper serves various communities along the Allegheny and Kiskiminetas Rivers, an area that the paper has dubbed "the A-K Valley." My trip to Utah has added two new examples to this list. The Salt Lake City area, from Ogden to Provo, is "the Wasatch Front." 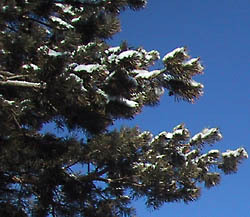 And warmer southern Utah, home of the Dixie National Forest, is sometimes called "Dixie." I was amazed to find the motel shown above, the Salt Lake Travelodge, still in operation across the street from the Olympic Medals Plaza at 144 West North Temple. 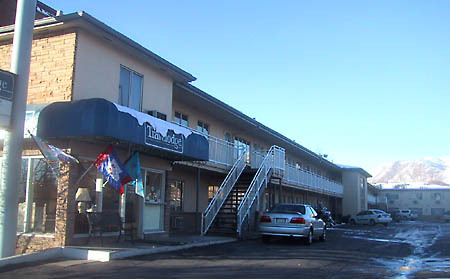 What's amazing is that my parents and I stayed at this very motel on my only previous trip to Utah. See the 1959 postcard picture below. For the 2002 Olympics, I did not stay at the Travelodge but rather at a Ramada Inn, located some six blocks south in the midst of the auto-repair and homeless-person district. This sign marks the back entrance off 300 West. 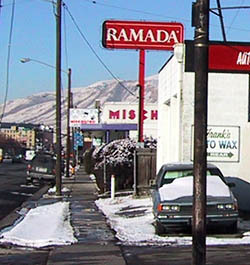 The Ramada is also just a rather ordinary two-story motel. But I didn't mind. Sometimes, sports at the highest level are less entertaining than the same sports at, say, the high school level. For example, ski jumping used to be exciting to watch. When I first saw it on TV forty years ago, it was possible to crash on takeoff. Remember the "agony of defeat" footage from Wide World of Sports? In flight, the jumpers used to struggle to maintain the correct attitude, sometimes windmilling their arms wildly. And on landing, crashes were common. But now the athletes have learned how to do it. With the help of better equipment, they can control their position precisely and consistently. They're awesome, but the uncertainty and danger has been removed. Watching ski jumpers compete in 2002 is the equivalent of watching airliners take off and land. Utah is a high desert. Streams flow down from the mountains to water the Wasatch Front, but Salt Lake City doesn't get much precipitation. During the month that I was in the city, the weather was almost always clear and cold. It was very cold at times, with typical morning lows around 5º above. But, unlike the winters in Pittsburgh, there was almost no wind. Dressed as I was in long underwear and the heavy ISB uniform, I had no trouble. Sometimes I could even go outside in the afternoon without a coat. However, the city is subject to temperature inversions, which trap the stale, dusty air near the ground. The air gets so thick that you can taste the dust. We welcomed our one brief snowstorm, which came on the morning before the Opening Ceremony, because it cleared out all the haze that was obscuring our view of the surrounding mountains. There were some flurries from time to time, and my birthday was a rainy day. But I didn't mind. One day, while buying a magazine, I was in line behind a reporter with a Russian accent. He was complaining to the clerk about American coins. "The coins have no . . . figures," he pointed out. "You are required to know." Another European simply extended his palm with some change in it and let the cashier pick out what she needed. I'd never realized that our coins have this deficiency. From childhood, we're taught to recognize them. "That big thick one is called a nickel and it's worth five cents. And this little thin one is called a dime. How many cents do you think the dime is worth? No, it's actually worth ten cents. That's twice as much as this big old nickel. Why? Well, silver is more valuable than nickel, and dimes used to be made out of silver, you know." Our country is so large that we rarely encounter the currency of other nations, except for Canada, which is similar to our own. But foreigners do come here, and we give them no help in understanding our coins. Take a handful out of your pocket and see for yourself. In fine print, the penny is marked ONE CENT and the nickel FIVE CENTS. If you know enough English, you probably can figure out that they're worth 0.01 dollar and 0.05 dollar. But the next coin is marked not Ten Cents but ONE DIME. You need to know some Latin to guess that "dime" means one-tenth, so the coin is worth 0.10 dollar. And the next coin, again in fine print, is labeled QUARTER DOLLAR. "What kind of barbaric country," asks Josh Fruhlinger, "would mint coins with no numbers on them?" Why don't we make it easier on our visitors? Why couldn't we label our coins with numerical values like $0.25, which would be understandable even to Asians who don't use our alphabet? Other crew members at the Ceremonies included associate director Wendy Acey, producer Leanne Chase, and technical director Keith Winikoff. The EVS operator, Ken Wagner from Tampa, was as underemployed as I was. Normally his duties involve recording and playing back short video clips, but we didn't have many. Ken had heard that we were part of an International Sports Broadcasting army of 1,500 television professionals and 600 college students. For the Opening Ceremony, my "font coordinator" (an assistant with almost nothing to do) was Auburn University senior Michael Sass. Afterwards, he became part of the crew for hockey's high-definition feed. For the Closing Ceremony, my font coordinator was Kristen Gruca, an Asbury College senior who by then had completed her duties as one of the Infinit operators at the curling venue. 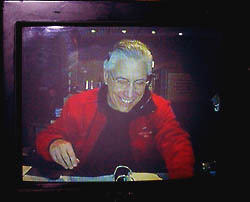 At the Opening and Closing Ceremonies, our world television feed was directed by Ron deMoraes (pronounced Demma-rye-us). This picture of Ron comes from a tiny video camera that was taping him for an instructional documentary. Of course, most TV students viewing this documentary would never be called on to direct a production like this. Ron had roughly 30 cameras to choose from, including cameras on two separate helicopters and on a building several blocks away. One cameraman was on ice skates in the middle of the ceremony. An unmanned camera was attached to the side of the cauldron, and two others popped up from the floor of a walkway to show the Olympic flag being carried into the stadium. Unlike other directors with whom I work, Ron directs entertainment shows, not sports events. His credits include the TV Guide Awards and Soul Train Christmas Starfest. Entertainment shows don't use lower-third graphics to identify entertainers. It's simply not done. At the Olympics, however, there were occasions in the script where the performers were not introduced by the public-address announcers. That meant that Ron had to identify them with my graphics. He didn't enjoy cluttering up his pictures that way. "Oh, I hate this!" Ron would complain every time. "Never again." It was almost as though he didn't like my work. But I didn't mind. Some other quotes from the Ceremonies crew . . .
"It'll be a long day, but at least I can take some dognaps." "Dognaps?" "Dognaps. I don't like cats much." "I used that tin-can-and-a-string analogy with my son. He said, why wouldn't you just use a cell phone?" "Pointing at nothing is the same as pointing at something." Translation: a zoomed-out camera that shows us nothing in particular is no worse than a zoomed-in camera that shows us an empty stage. Certain video inserts were supposed to appear simultaneously on our feed and on the stadium's huge video screens. Rather than trying to start two tapes at once, we decided that a single tape should be fed both to the screens and to us. "The simple way to do it is the right way to do it. There's no need to re-invent the wheel." "Well, they're working on the connection; we don't have it yet. So we're still in the triangle-wheel mode." In addition to me, several other Pittsburgh freelancers made the trip to Utah. 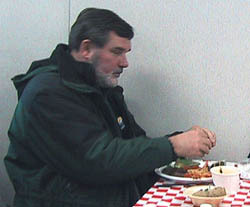 Here, Chris Dahl breaks bread in the catering trailer at the Opening Ceremony. Mark Vidonic did graphics for curling every day from 8 AM to 10 PM. Others worked for NBC, including Paul Duda and Jay Kuntz. And I saw other familiar faces from around the country. These included TD Rick Tugman and director Mike Wells, who handled NBC's Closing Ceremony coverage. The ceremonies were held in a converted football stadium, and performers sometimes were on a stage in the south end zone. Nearby cameras could give us profiles of the performers, but for the head-on view, we routinely used a camera in the stands beyond the north end zone, a hundred yards away. Lenses for full-sized TV cameras have become as powerful as telescopes! For example, one afternoon during a break in the rehearsals, a camera followed a man hiking up a mountain miles away. For another example, recall the "beauty shot" that you've seen on nighttime football or baseball telecasts: the full moon rising over the stadium. The TV camera reveals the craters and maria of the moon in great detail. It almost seems as though we should be able to see the lunar landing vehicles sitting there. One evening before the Closing Ceremony, we noticed the moon on one of our monitors, but there was also a smaller bright disk nearby. The camera zoomed in some more. The small disk was marked with a couple of darker horizontal stripes, and off to one side were four other bright dots. I realized that we were looking at the planet Jupiter and four of its moons! After the Closing Ceremony on February 24, most people wanted to leave town the next day (Monday). The Salt Lake City airport wasn't built to handle volumes like th at. Passengers were standing in line for hours, and some missed their flights. I, however, had a little bit of packing-up work to do on Monday back at the International Broadcast Center, so I wasn't scheduled to fly home until Tuesday. Not wanting to miss my flight, I left my hotel at 5:00 Tuesday morning. At the airport, the lines were long but not that long. By 5:55 I had my boarding pass, and by 6:18 I was through security and at the gate. My plane wasn't scheduled to leave for nearly another four hours. But I didn't mind. Want more? Click here for an archived column by a writer from Provo. His subsequent 14 columns are linked here (scroll way down to February 2002). And for my other article, giving an overview of my work at the 2002 Olympics, you can click here.